A new work of short fiction from the 2012 Derringer-nominated author of Ballistic. When you need to hunt down a god, call a sniper. The D.E.A. believes Marine Corps Sergeant Matt O'Connor is their best bet to capture the deadliest meth kingpin in the United States—Herman Estevez, the self-proclaimed "God of Speed." Special Agent Sam Brookings drops O'Connor into thick Ozark mountain country with a simple directive: stake out backwoods drug labs and pinpoint Estevez, a man who has eluded the D.E.A. for years. When O'Connor finally verifies the kingpin's location, Brookings leads an assault team to bring in the D.E.A. 's most-wanted, using the Marine sniper as an observer only. O'Connor, though, isn't built to merely observe. 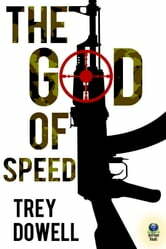 Brookings soon finds himself in the worst position imaginable: trapped between a heavily armed outlaw and a warrior with a rifle who lives to dispense swift justice—the kind that comes at 3,200 feet per second.